I bought another lab toy to play with specific to looking at water quality a bit more. While most veteran water coolers understand there is no such thing as “Non-Conductive” coolant, you still see quite a few coolants labeled as “NON” conductive. What I’ve been struggling to better understand myself is how good or bad various things are such as distilled water vs. tap water vs. other coolants and how that all changes as the fluid is run through the loop. With that, I decided to buy an EC/TDS meter and PH meter as tools to help me explore water quality a bit more scientifically. I will add to this as I go, but for now a few quick pictures of some random tests. Distilled water is produced by a process of distillation and has an electrical conductivity of not more than 10 µS/cm and total dissolved solids of less than 10 mg/litre. Distillation involves boilingthe water and then condensing the vapour into a clean container, leaving solid contaminants behind. Distillation produces very pure water. A white or yellowish mineral scale is left in the distillation apparatus, which requires regular cleaning. Distillation alone does not guarantee the absence of bacteria in drinking water unless containers are also sterilized. For many applications, cheaper alternatives such as deionized water are used in place of distilled water. Anyhow, I decided to take my unit straight out of the box and record some measurements. Granted this is per the original calibration which may or may not be off to some degree, it did seem to give reasonably expected results. 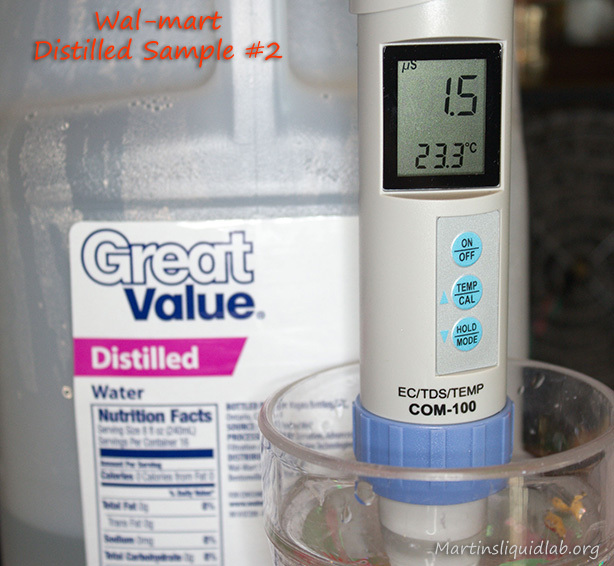 My grocery store distilled water samples both tested well under the 10uS wiki definition. And my household “Tap” was considerably lower than the 500-800uS definition by the other link. I guess I’m fortunate to have fairly clean tap water. Never really cared for Dr Pepper myself, so I wanted to measure how bad it really is…:) I’ll do a good beer next time..lol! Anyhow, not a lot to conclude at this point other than my $1/gallon Wal-mart distilled is measuring pretty darn clean and it makes me wonder if you are really getting any benefit at all from the “Ultra Pure or double distilled” types. I’m more curious what happens to that single digit uS level after it’s running in the loop for a while getting contaminated by metal ions, flux, and plasticizer from tubing. If the water immediately shoots up to 200uS from 1-3uS regular distilled water, do you really care about the 1-3uS? That’s the question I have.